Fans of Apple, or Nike can queue for hours, or even days when a new product is released. In addition to the products themselves they might zealously slap stickers with the logo all over their belongings, but even advocates of these brands are unlikely to tattoo the company logo on their person. However, there is one brand where this happens. The company doesn’t pay these zealots, in fact you could even argue the zealots pay the company. Ironman is an organization that runs endurance events. They are responsible for the Singapore Marathon, the Bordeaux Marathon, and in 2017 they bought the company running the Rock n Roll endurance races. However, it’s for triathlons that they are best known, and their swim-bike-run event in Kona, Hawaii is the race all the top athletes want to enter and win. Merely qualifying for the Hawaii event is a crowning achievement. The full distance triathlon, with which their name has become synonymous, will usually begin at 7am with an hors’ d’oeuvres of 2.4 miles of open water swimming. You’ve little time to digest that before moving on to the main course, a 112 mile bike ride. Dessert, if you have the stomach, is a full marathon. The total distance is just over 140 miles, or 226 kilometres. Cut-off time is midnight, or 17 hours. Participants don’t take the event lightly. Anyone who is serious about successfully completing an Ironman triathlon will start formal training for a September event in April, and should already have some base level of fitness. There are days they need to train twice, and as race day nears the weekends become almost wholly given over to ever longer bike rides and ever longer runs. (The swimming will commonly be during the week.) By the time of race day participants might expect to have run over 500 miles in training, and biked in excess of 2,000 miles. The financial cost is not light either once you’ve paid for: triathlon clothing, a separate wet suit, goggles, bike, bike shoes, bike helmet, replacement bike parts, bike maintenance, running shoes, coaching fees, physical therapy, massage, anti-chlorine shampoo, anti-chaffing cream, expensive go-faster sunglasses, energy bars, energy gels, energy drinks, and probably dental bills as well considering all of that sugar. The race fee itself is not inconsiderable, and since races are rarely on your doorstep you may also need to incur air fare, car rental, bike shipment costs, and accommodation all before the requisite trip to the tattoo parlor. Write out a check for $2,500, but be prepared to pay more. It’s no wonder, after such commitment, such sacrifice, and such expense, that finishers want to brand themselves with evidence of their achievement. It’s common to find the Ironman logo painted on a bulging calf, but there are many body parts selected for the ink, and even more variations on the logo design, perfectly reflecting the diversity and individuality of those undertaking the journey. It would be easy to think the participants are all lean, muscled men with too much money, too much time on their hands, and too much testosterone but in truth the participants are a glorious pot pourri of age, gender, race, nationality, faith, political persuasion, ego and physique. What they do all share is their commitment to the journey and a desire to test themselves in this way. I would also speculate that the majority are competitive, over-achievers and I wouldn’t be surprised if even their blood is type A. However, few compare their finish times — they just want to make the cut-off — because everyone is on their own journey. The support for one another at such events is palpable… and addictive. Although not always visible, it’s understood that each has their own obstacles to navigate and so comparing times is an exercise in futility. Comparing is not the point. Whether you have five children or none, one kidney or two, one leg or two, this diverse group of people just want to come together and see what they themselves are made of; everyone trains and races to the beat of their own drum. There is even room for my friend, Don, who definitely does not have type A blood. Knowing that my friend Don was doing such an event later in the year, but knowing little about these undertakings at the time, I naively asked him if he had a finish time in mind. He quipped, “I want to cross the line at 11:59pm”. Don didn’t win but he did finish. I don’t know his time either but it was probably too fast for his liking, although in a ranking of value for money I expect he was way up there. When anyone asks him his time he might shrug, or he might tell them, it probably depends on their blood type. The time is irrelevant anyway. He has earned the label without needing to mark himself. He said it wasn’t necessary because HE knew what he had done, and that was the most important thing. When he said that, I thought about our hidden allegiances, our hidden tribes, and I thought about Don’s humility. He smiled. “Some of those tattoos are really pretty cool though. They just aren’t for me.” I looked back at him, standing there in his Ironman hat, his Ironman t-shirt and his rather pricy Ironman finishers’ jacket, drinking coffee from his Ironman mug, and I found myself nodding. When we cheer on marathon runners, are we applauding the right thing? We can always rely on family and close friends to keep our feet on the ground, and to remind us that sometimes what we do is not normal. I’m writing this on the eve of the 2018 Chicago marathon. Most of those taking part will have been in formal training for over four months. Chicago has a large number of group training programs, which is lucky because it helps to have coaching, it helps to have peer support, and because misery loves company. Towards the beginning of training the athletes may run 15 miles a week. As they progress through the program this can climb to peak in excess of 40 or 50 miles. Their bodies are being pushed beyond what were once were limits. As new thresholds are breached, successes are celebrated. As unexpected injuries arise, they are navigated… or commiserated; simply getting to the start line in something close to one piece is a huge win. On their journey they will learn more about physiology and anatomy than they ever wanted to know: which muscles work in tandem with one another, which joints suffer when a body is out of balance, and how to address weakness in stabilizing muscles through cross-training. They will learn a foreign language with words and expressions such as ‘plantar fasciitis’ and ‘iliotibial bands’. The risk of over-use injury increases with each week if the training isn’t measured. You can’t cram for a marathon. Consistency is key. In addition to their muscles they are training their gut to absorb an amount of sugar that would make a dentist weep. Post race showers perform a cleansing role – vital to their loved ones – but the hot water also serves to inform them, painfully, which parts of their bodies they need to lube in order to head off sometimes bloody chaffing. And all those miles on their feet will build the calluses needed to protect them on race day; you don’t want to lose this hard-won armor during a pedicure. What each runner puts into a race is beyond impressive, but this is only part of the story. A successfully completed marathon training program takes self-discipline, and it takes sacrifice. The opportunity cost, as economists refer to it, of training for an endurance event is immense; it’s not what you do in order to achieve success, it’s what you give up. Near constant tiredness means prioritizing sleep wherever possible. If the runner has a family and only a small support network then this is not always an option; there are many days they are flying on vapor. Other hobbies, past times, and responsibilities are put on ice to accommodate what quickly becomes an inflated time commitment because in addition to the core event listed in the training program, the runner needs to factor in the travel to and from, and stretching immediately following. What the training program also fails to mention is the time required for sports massage, physical therapy, buying new running attire, nutrition,… and the list goes on. Running becomes they only thing they can talk about. Finally, the role of the support network can’t be understated. It’s not just the runner who is giving up time with their friends, it’s also the friends giving up time with the runner. At home a partner may be taking on more of the chores. And don’t forget the emotional wringer; it’s a roller coaster of joy and misery, delight in hitting goals, doubts when they are missed, or when the athlete needs to start all over again after an injury. It takes a village. If a marathon takes place in your city, please cheer these people on. Please also know that marathon running is very much like the proverbial iceberg and it’s not just for that one day you’re cheering but also their hidden effort, their hidden sacrifice, and their hidden village. Thank you for your support. I still remember my worst stitch. I was 12 years old. Our school class had trooped off to a local park late in the autumn term to do one of those British weather-inflicted cross-country runs that teachers think are fun, and that kids think are stupid. We were deployed like mini Marines on manoeuvres and on this day the overused paths were peppered with deep puddles and cloying mud from frequent rain; our activity was more of an obstacle course than an afternoon jog. I quickly worked out the secret sauce for success in these activities; the technical name is called being bothered. At 12 years old most kids couldn’t be. If you were in the ‘Not Bothered Brigade’ you had two tactics for keeping for your feet dry: hug any tree holding the high ground either side of the obstacle and then jump when necessary, or carefully pick your way through brambles. The NBBs would invariably return from their exertions with chests covered in verdant moss, and with tiny red rivulets on their arms and legs. Apparently, the possibility of blood was better than the inevitability of mud. I was looking forward to getting back to the showers early and was squelching along, feet caked in mud, minding my own business, when an invisible knife pierced my side just below the ribs. My phantom running buddy pushed the blade in further, and then twisted it. I like to think I didn’t scream, or at least yelp. I probably did. I paused for a time and recall looking back; the blood warriors were still out of sight and I was on my own. I eventually began walking again, ever more briskly, but the stitch remained. In fact it didn’t even get better until some time after the end of the run, and as is the case for many things in life I simply learned to live with it for as long as I had no choice. The next time it happened I had a teasing warning, as though my hidden tormentor was playing with me. I tensed in anticipation, waiting, waiting, until the blade finally made its way through the side door and just sat there, inside me, like the dodgy relative who turns up on your doorstep unannounced, eats all the best cookies, and who can’t take a hint that it’s time to leave… not realising it was never even time to arrive. A stitch is what I always called it but the name doesn’t really matter. Others might call it the runner’s stitch, side stitch, side cramp, ‘ETAP’ (exercise-related transient abdominal pain), etc. We could call it Fluffy Bunnykins and it wouldn’t make it any less annoying or painful. It can happen when I am running fast, and even when I’m running slowly and it feels like a knife or a needle, although I understand others can experience it differently, perhaps a dull ache. It was of no relief to eventually learn it had affected Olympians and marathon greats like Haile Gebrselassie and Deena Kastor. All of these are good advice anyway, apart from avoiding sugary drinks bullet point. (It’s hard to do a long run with no carbohydrate.) The getting old thing is also to be avoided where possible, unless you’re as ageless as Audrey Hepburn. Audrey Hepburn has nothing to with stitches or running, at least as far as I know, but any blog post is going to seem a little classier with a light sprinkling of Audrey. She’s awesome! Just saying. The only things that have worked for me are slowing or stopping. In his book, Born to Run, Christopher McDougall notes that unlike most animals the breathing of humans is disconnected from our running pattern. Contrast this with a cheetah, whose leg motion acts like a bellows for its lungs. I.e. its lung activity is directly connected to its leg activity. A cheetah is fast, but it cannot last long. Homo sapiens, however, can take long deep breaths or short sharp breaths, mixing up the pattern as and when needed, regardless of our pace or the motion of our legs. We can’t outrun a cheetah over short distances, but we can outlast a cheetah over long ones. This flexibility in the way we breathe, which should be an asset, was also my problem. Periodically I would do it all backwards, sometimes when I was running quickly, sometimes when I was running slowly. When I did breathe into my belly, I was squeezing in my tummy just as I was trying to fill it with air, and pushing it out when I was trying to exhale. That second point is really important… and it makes no logical sense. I was putting my internal organs under strain by asking them to make the space inside my abdomen smaller just as I was trying to fill it, and to make the space bigger just as I was trying to empty it. The Far Side’s “Middle School for the Gifted” sprang to mind. Somehow, over the years of being more bothered than most 12 year old kids, I had developed this totally incorrect habit. Audrey would be horrified. how is my nutrition and hydration? am I pushing out my belly as I breathe in /squeezing in my belly in as I breathe out? I still catch myself breathing incorrectly but at least I’m aware, and I hope that if I keeping checking in with myself the new habit will eventually become engrained. The latest word on stitches is that the issue is not Fluffy Bunnykins at all but rather the parietal peritoneum. (If only I had known this earlier in the article.) The connection between the parietal peritoneum, a membrane around your abdomen, is… going into too much detail. Instead I think it’s safe to say that when it comes to stitches, lots of things can bring it on and the trigger can vary from person to person because we’re all individuals. Endurance runners know there is no one size fits all solution. In much the same way that one form of nutrition is great for one person and by hated by another, we all need to find our own path when we suffer discomfort. I’d advocate addressing whatever will bring most benefit quickly. If poor eating just prior to a run is your kryptonite, then that’s what I’d focus on first. However, if you walk around stiff as a board all day then I’d focus on your flexibility. If you’re not sure then you might need to hit a few tactics all at once. 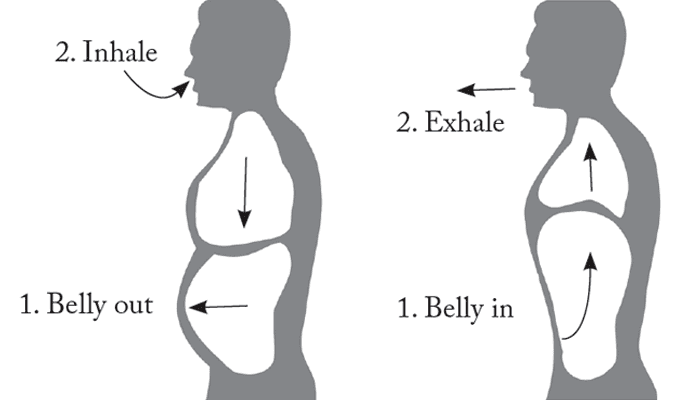 This article says breathing is the solution. Well, it’s my solution. I think I had slowly eliminated the larger risks until I reached the point where breathing was simply the next big thing to address. Even now, as I reflect, it may not address the issue for the reasons I believe. Maybe going through that breathing check just reminds me to address poor form. Maybe the focus on breath distracts and relaxes me – a breathing, running meditation of sorts. Maybe it’s not down to breathing at all but rather because I just got even older. Maybe I don’t need to understand why it works at all; right now I only care that it seems to be doing the job. Disclosure: the links to the two books below are affiliate links, meaning, at no additional cost to you, I will earn a commission if you click through and make a purchase. Yesterday I missed out on a huge banquet that I had been looking forward to attending with a large group of friends. Instead I was stuck in the activation system of a mobile phone company, able to move neither forward nor back, while a very nice chap in the store, who we’ll call Peter (because that was his name) hung on three separate phone lines – even borrowing devices from his work colleagues – for over an hour and a half, in an effort to get through to someone who could help. I had been guilty, as is often the case, of trying to fit too much into my day, and so when something that should have taken a maximum of 90 minutes eventually takes closer to 4 hours, something had to give. The banquet I missed (I’m picturing knights and roasted hog, with partially picked bones tossed to wolf hounds lounging by a castle fireplace) was all part of the build up to an all day endurance event this Sunday. (Scratch knights and hogs, and replace with inspiring athletes and troughs of pasta? Sadly, I’m still guessing here.) But in missing it, two things occurred to me. The first is what I’m doing badly. Namely, treating everything as something on a checklist that needs to be ticked off. The work required to get me to this point has been such a cram, that I have spent almost all my time in doing, and very little in being. I’ve been on the treadmill so long that I’ve forgotten it was always supposed to have been as much about the journey as the destination. The thing I did well was just roll with it. My patience was eventually rewarded in the store with $175 worth of freebies. True, I’d missed out on the wild boar and the jousting, but I got free stuff. Bonus! A lot is going to come up in this endurance event, which I have up to 17 hours to complete. Not all of those things will be expected, or even welcome. I just need to keep moving forward and whatever happens, roll with it. If I can do that, $175 will seem like small potatoes when compared to the reward. You, your coaches, and those training with you all agree on the goals, and their relative priority. You build up your capabilities slowly. Each week you are given specific and measurable step goals against which to deliver. Feedback is instant, and where goals are undershot (or even overshot), an adjustment is made immediately to compensate. Part of the work out is effort based, but part is knowledge / skills based, so that subsequent effort delivers ever more benefit. The mood is one of nurturing and encouragement. There is a cadence of builds and recuperation across the weeks and months, to aid consolidation of the work to date. Dialogue and openness are constant. If you don’t do your workouts, the coaches don’t step in and do them for you. There is both a long term aspect and a short term aspect to the work. The two aspects dovetail. You have the opportunity to find ways of working that are best for you, but within an established set of common guidelines. You are ready weeks before the main event. The final weeks are gentle affairs with more sleep, and greater time in recovery so that you’re in the best shape for demands of the event itself. When asked last year why I was training for a triathlon, I flippantly replied that it was to look good naked. I’m not going to comment on whether I achieved my goal (although I totally did) because beyond this superficial (but important) motivator, I ended up having a great deal of fun. And so, last October, from a budget hotel room in Amiens in Northern France, on their interminably slow Wi-Fi, and on my even more interminable phone, I spent about an hour rashly signing up for twice as much fun, and twice as much sexiness. As I write now, some eight months later, I’m trying to recall the thought processes that went into that decision. I like to believe I processed all the information available and made a balanced decision but decisions are rarely made with the brain alone. My curiosity played a part; I like to test myself, to explore my capabilities, whether that be physically, mentally, musically… (admittedly, I don’t explore very far sometimes) but if I’m being honest, my inquisitive nature didn’t account for much. Ego, and a certain arrogance, were bigger contributors, because the friends I watched compete in the same race last year made it look easy, and so I felt sure I’d be able to do the same. I also recall how well things had gone for me in 2015. It helped that I remained free from injury, able to meet the time commitments of training, and I recall how relaxed and confident I felt on the day of my event. When things come easy to you, complacency and over-confidence are hard to avoid. Loath as I am to admit it, ego did play a bigger part than the aforementioned (and far more noble) trait of curiosity. Let’s just say I’m a LOT more humble now, and I have even more respect for what my friends achieved. But it wasn’t just ego either. I had never heard the term until earlier this year – such is my sheltered existence – but I’m beginning to think I was finally swayed by an attack of the FOMOs. Of course my ego won’t let me think I had a “fear of missing out”, just as my ego won’t let me think I signed up because of my ego. Egos are funny like that. Ultimately the reasons are irrelevant. I made the decision, and once any true decision has been made, you commit. You need to have committed, because it is hard. It’s very hard. You are effectively taking on a second job – did I say it’s hard? – and the loss of all that spare time affects not only you, but those around you who rely on you having that free time, and that flexibility. I don’t regret the decision – never regret. I imagine that when I reflect on this time, some eight months from now, my memory will have dulled the frustrating and unpleasant and instead I will be left with only the more positive emotions. But I’m not in the future yet and so right here, right now, I’m convinced there are less time-consuming, less exhausting, and less expensive pathways to all of that fun and sexiness, just as I am convinced that some of my friends will tell me there isn’t a triathlon in the world long enough to make me look good naked… but then how would they ever find out? I’d hear running coaches extolling the virtues of core strength, stretching, speed work, etc. I’d acknowledge the benefit of their experience, and then immediately ignore it. I went back to doing what I liked doing, which was running long and slow. I was running because I enjoyed it, and who takes up a hobby to do the bits in it they don’t like? As time progressed, I was telling myself there must be more to this hobby, and I did want to run faster. I had a choice: either do more of it, or drop it for the next activity of interest. I chose to do more. Except I continued to even more of the bits I liked, until I got a knee injury. I went to a physical therapist called Molly. For the sake of this story, we’ll call her ‘Molly’, because that was her name. [Her name isn’t relevant to this story but I often come across books where names have been changed to protect identities, and since Molly was great, I’ll leave hers in place.] She had me lie on my side and raise my upper leg in the air. She then asked me to hold it there and resist, as she pushed down, with one finger. I had no response, and my leg collapsed back down to its partner. The coaches had been right about core strength. Who knew? That first visit to Molly caused me to revisit my own know-it-all attitude to those running coaches. I decided to use my running time differently and redeployed some of it in strength training. I found myself running faster, despite reducing my weekly miles. I expanded the approach, and took some more time from my long runs to give to speed work. 90 minutes of long running might translate to 45 minutes of speed work; I was spending even less time running yet this too was helping me go faster. I used that ‘spare’ time in yoga, or sleep. It was great. There was also the added benefit of less time running meaning less chance of injury. That year, I achieved personal best times in marathon, half marathon and 5km. I’ve always liked the musical rhythm in the saying, “If you keep doing what you did, then you keep getting what you got.” I was reminded of that saying (which I first heard from DiNozo, on N.C.I.S.) as I listened to a Freakonomics podcast on ‘being great at absolutely anything’. That podcast cites the source of the perfectly round 10,000 hours of practice required to become an ‘expert’. The figure of 10,000 was launched into the public consciousness by Malcolm Gladwell in his book, ‘Outliers’. I haven’t spent anything like 10,000 hours doing anything of note. I’m not absolutely great at anything, but the podcast was a useful reminder on the wise use of time when you want to improve. You need to do things that you’re less inclined to do. More importantly, you need to live, for much of the time in a place of discomfort. We fall into comfort zones either because they are things we like doing, or because we have carved grooves for ourselves that might once have been uncomfortable, but have now become too familiar for us to leave. Growth comes when we push ourselves outside of these familiar furrows but doing so is draining, and not just physically. It takes mental and emotional energy to live in a state of discomfort. And it’s not enough to apply the correct effort; we need to apply the correct effort correctly, with ‘best form’. Practice doesn’t make perfect; perfect practice makes perfect. My trajectory isn’t steep. I plateau a lot. I need to recharge those emotional and mental batteries so that I can take another run at improvement. It comes. I slip back. Sometimes improvement seems to come from nowhere. I like those unexpected leaps in capability where you suddenly just ‘get it’, and you’re not always sure why and when it came the way it did. Those leaps are a spur to further improvement. Those leaps never comes from a comfort zone. I now know how to train, and the more time I spend in that zone of discomfort, the easier it becomes. In a way, that zone of discomfort becomes a sort of comfort zone in its own right. I’ve observed that I only needed to find this zone in one activity for me to be able to apply it to others, like practising a musical instrument, or learning a language. As my Tai Chi teacher used to say, “having it is less important than knowing how to get it back when it’s lost.” So much is possible if you can find comfort in the uncomfortable. During the mid noughties I decided I wanted to run a marathon. Applications for the race I wanted to run open up nearly a year in advance, in April, but you have to wait until around October to find out whether you succeeded in the lottery draw for places. At the time I lived barely half a mile from the start line of the London Marathon. I applied, and I began to run. Not everyone is blessed with the rich training ground I enjoyed. Set in southeast London, Greenwich Park is full of wonders: deer, trees that date back to the mid 1600s, and a line in the ground separating the east of our planet from the west. The National Maritime Museum runs along the bottom of the park, near the river, and later provided the backdrop for the equestrian events at the 2012 London Olympics; the museum houses treasures from Captain James Cook and Admiral Horatio Lord Nelson. (Although that title seems a bit of a mouthful, his full title is almost as impressive as his deeds.) Looking down on this museum, from atop one of the highest points of London, is the 400 year old Royal Observatory, whose own museum houses John Harrison’s marine chronometer, the device that solved the problem of longitude, and arguably helped the British Empire reach the extent that it did. The park is truly an embarrassment of riches. When Greenwich Park became too small for my running, I ventured to run behind it, on Blackheath Common. With an elevation of about 150 ft (50m) it could get very windy, and you sometimes had to take care not to entangle yourself in the lines of the many kite fliers taking advantage of the flat expanse of land. 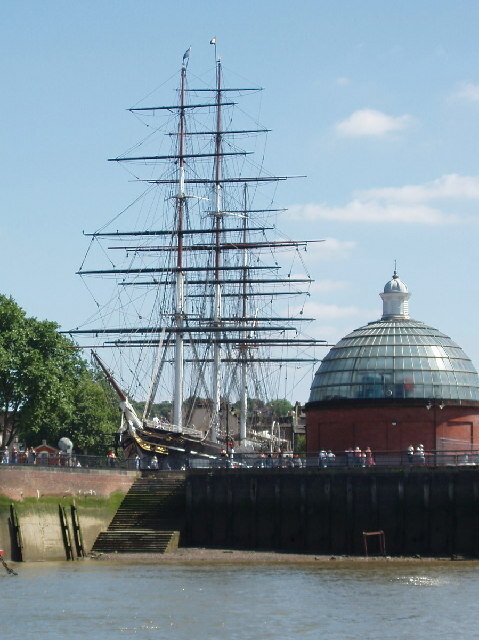 On occasion, I even ran under the River Thames, through the foot tunnel on the other side of the 18th Century ship – the Cutty Sark – once one of the fastest sailing ships in the world. That summer was a glorious exploration, and so as I write about this time, nearly a decade later, I can’t even recall the extent of my disappointment when I received the email telling me that I didn’t get a place for the following year’s race. I took the winter off entirely and then reapplied. The exploration and education of my own city continued the following year. Marathons are not as long as the training required to prepare for them, and even the park and heath, which had seemed enormous when slowly walking them with family and friends, quickly shrank in size. My typical training session was soon taking me in excess of 14 miles, and I uncovered parts of London I had never known existed, like Eltham Palace, an Art Deco wonder, once owned by the millionaire Courtaulds, and still displaying some of the original 15th Century Tudor architecture from the original structure. When I received the email telling me I had a place, I continued running, this time through the streets, and through the dark nighted London winter, where the sun rises around 8am and sets before 4pm. At that time, I had never heard of iliotibial bands, the gluteus medius, or foam rollers. Knee pain caused me to pull out of the marathon. I thought running was uncomplicated (and now, years later, I know more about anatomy, physiology, and running related injuries than I ever thought I needed). Luckily, I was able to roll my place into the next year’s race. When the same thing happened the following year, with the same knee, I lost my spot in the event entirely. I went to a specialist in body movement, who told me I just wasn’t designed to run a marathon. I gave up. Sort of. In 2009, I moved to Chicago. I found myself working with a crazy Venezuelan who thought it might be fun to run the Chicago Marathon. Curiously enough, I found myself once more living just half a mile from a start line. Friendship, and a bloody-minded attitude, prompted me to sign up. There was no lottery this time, I was in. WE were in. For the whole of 2010, whenever anyone asked me my marathon goal, I gave only two responses: to get to the start line, and to have my knees in one piece when I was 50. Time was of no importance. If I hurt, I stopped. I recall doing just that on several occasions. I learned the difference between discomfort and pain When you feel discomfort, you work thought it; when you feel pain, you stop. But after failing to run in the London equivalent, I still recall the ever-present anxiety I felt that I might not even make it to the start one more; I wrapped myself in cotton wool. Peer support certainly helped. I learned about foam rollers. I learned downward dog, and pigeon’s pose, and I foam rolled my iliotibial bands until I didn’t want to smack someone in the face with a wet kipper. (Anyone who has ever rolled their ITB will know well this urge so smack someone with a fish.) And because I was both more informed, as well as unattached to a time goal, my progress to the start line was more balanced than it had ever been. I was assisted by regular massage, as well as by the articles on injury prevention, which I read voraciously, and by the people with whom I found myself spending time. I was able to get to the start line in 10/10/10 – my inaugural marathon – on a mercifully easy date to recall and convey (regardless of whether you read it in US or UK date formats). I had spent five years getting to the start of that run. Part of that time was down to the need to accumulate sufficient knowledge, and part was developing my body’s capacity to last. I did finish, but that is irrelevant now. Simply getting to the start was everything. You learn, and you grow, and you assemble a toolkit of knowledge that equips you to deal with the peculiar set of challenges you face. We are all built differently, and my process took as long as it took to coalesce. It had begun with a simple goal, to run a marathon, but as I look back now, the goal was only important because it caused the journey to be. A goal is important in overcoming inertia, and in generating that early momentum. However, the achievement of a goal is an ephemeral thing, rather it is the journey that is the joy, and the time that journey takes is of no consequence.